How is this different from conventional surgery? Unlike traditional joint surgery that requires large incisions to expose the joint, arthroscopy uses small openings to examine the joint. In this fashion arthroscopic surgery reduces the risk of infection and swelling. Podiatric surgeons use delicate instruments and miniature video cameras to perform arthroscopic surgery. Arthroscopy is generally performed as an outpatient procedure allowing the patient to return home the same day. When is this type of surgery useful for foot and ankle problems? 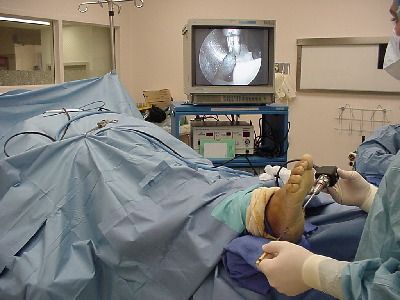 Presently, arthroscopic surgery is most commonly used for some painful ankle conditions. Often times, patients who have experienced a past injury (i.e. sprained ankle) continue to have persistent discomfort that may eventually become disabling. Arthroscopic surgery proves to be very effective in treating this condition. Heel Spur Syndrome, specifically plantar fascitis, is another common foot condition that can be treated by arthroscopic means. When conservative therapy fails to alleviate the patient's heel pain, Endoscopic Plantar Fasciotomy has proven to be effective. Over the last few years, laser foot surgery has received a lot of publicity. Some material suggests that lasers could be used in conjunction with bone surgery. For example, several patients ask me whether their bunions can be removed surgically with the use of the laser. The present day laser used for some foot surgery is called a Carbon Dioxide (Co2) laser. This laser is designed to work strictly on soft tissues, that is skin, and tissues under it, but not bones. At the present time, there is no surgical laser designed to cut bones. Therefore, the misconceptions held by many people that a laser has application in bunion surgery are not the case. The present day Carbon Dioxide laser is not a tool for bone surgery. So when do we use lasers? In this office, at the present time, the laser is used for nail and soft tissue problems. Examples being: ingrown toenails, fungal toenails, excision of warts, and some callous-like problems, as well as removal of some soft tissue growth. At the present time, I find that the laser when used in their appropriate place, is extremely valuable for precision work. It apparently causes our patients less discomfort, and decreases the disability associated with such procedure.